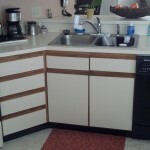 We removed the original 70’s era kitchen cabinets from this villa. 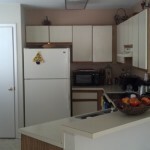 We installed new Maple Shaker Style Cabinets, in Espresso Finish, Granite Countertops, New Microwave-hood & New Dishwasher, New 12×24 Tile Flooring, & New Paint. 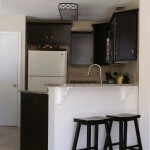 This kitchen turned out beautifully! 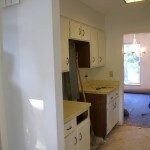 The original kitchen in this villa was damaged by a flood, from water heater in attic, as well as flooring, several areas of drywall, light fixtures in dining, etc. 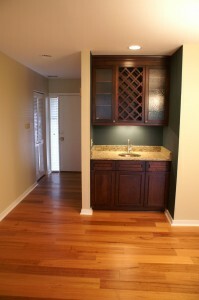 We installed all new flooring in main living areas, lighting where damaged, kitchen & wet bar plumbing, cabinets, Granite Countertops, and Appliances in this galley style kitchen, as well as added the wet bar in the dining area, the wet bar space was a closet before the conversion. 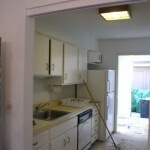 All damages from flood were repaired, the new kitchen was the highlight of this project. 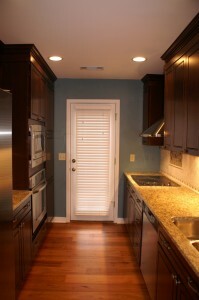 In this kitchen remodel we removed the walls of the small galley kitchen, opening the kitchen to the living room, by doing this we gained the space that once was a hallway which gave us the ability to expand the kitchen space substantially. 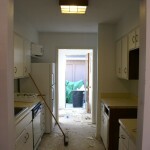 We installed all new tile from front entry through dining room. 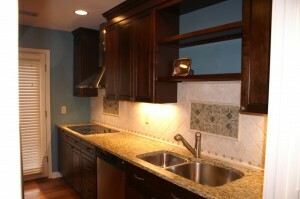 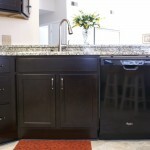 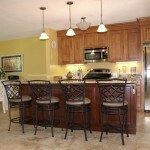 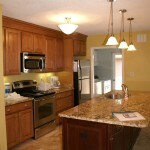 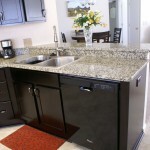 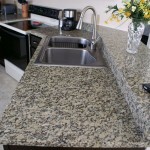 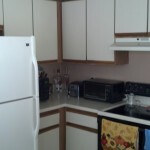 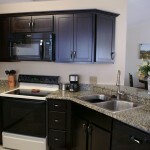 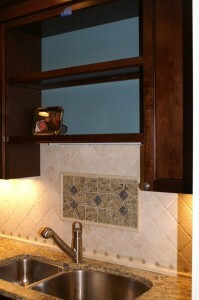 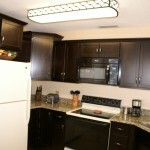 We installed all new cabinets, new Granite Countertops, and new Stainless Steel Appliances. 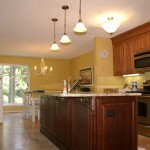 This design really transformed the old cramped kitchen into a Kitchen that you can cook a great meal in, the open plan makes it great for entertaining!